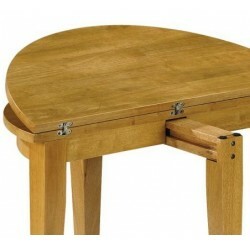 Wooden Dining Set There are 77 products. 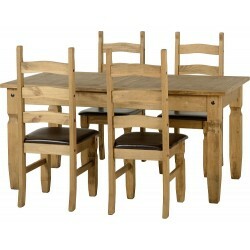 The Bailey Parson Dining Set 4 Chairs Oak veneer table with solid legs that help to form a well built table. Table top features two inlaid walnut rectangles. Chairs are Upholstered with Faux Leather and Legs are Wooden. Chairs are available in different colours. 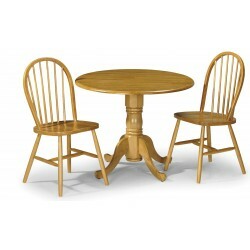 The Manhattan Parsons Dining Set 6 Chairs Oak veneer table with plain top. The Manhattan Dining Table With 6 Parsons Chairs is a versatile set suited to both modern and classic dining room settings. 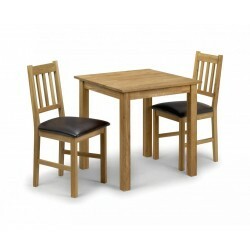 The oak veneer table has clean and crisp finish with straight edges which work well with the faux leather dining chairs for a well rounded look. 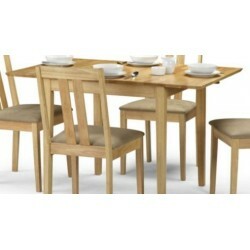 The Manhattan Oakland Dining Set 6 Chairs Oak veneer table with plain top. The Manhattan Dining Table With 6 Oakland Chairs is a versatile set suited to both modern and classic dining room settings. The oak veneer table has clean and crisp finish with straight edges which work well with the faux leather dining chairs for a well rounded look. 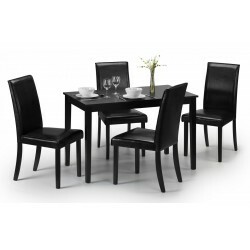 The Carmen Dining Set with 4 Chairs with Black matt finished wooden table with solid wooden legs. The Carmen dining chairs have a scroll back with matt finished legs and a soft “velour” type fabric. The Carmen Dining set is available with Four chairs in grey stripes on cream fabric (Pic #1) or grey stripes on darker grey fabric (Pic # 2). The Cyprus Dining Set has a contemporary design, The table is a solid ash wood, with an ash veneered top and the chairs are in faux leather with oak legs. The chiars are available in different colors. 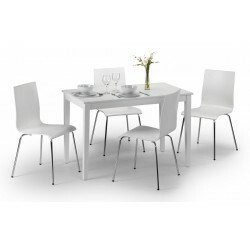 This stunning Dining set is available with four chairs and six chairs. Cyprus Small Dining Table with Four Chairs. Cyprus Large Dining Table with Six Chairs. A touch of rustic quality, the Corona boasts a waxed wood finish and ornate black detailing to add an air of elegance to any room. Constructed from solid pine, the Corona large dining set features contrasting black stud detailing and comprises a dining table plus four chairs - perfect for any dining room.